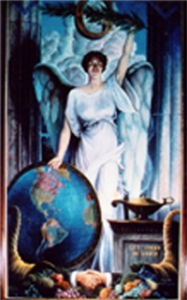 The Iowa Academy of Masonic Knowledge (IAMK) is a committee of the Grand Lodge of Iowa, A.F. & A.M., that offers Freemasons opportunities for advanced study of the Three Degrees of Freemasonry. The Academy includes numerous courses of study for Entered Apprentices, Fellowcrafts, and Master Masons. Members of the Academy have access to a vast collection of Masonic Research resources while they advance through three levels of research including the Academy’s Featured Program: the Masonic Scholar (Level I); the Master Scholar (Level II); and the Adept Scholar of the Academy (Level III). Symbolism is another focus of the Academy including the “Symbolism Program” which includes the courses, “SYM-101 – Symbolism 101” and “SYM-102 – Symbolism 102.” These courses take an in-depth look at numerous concepts contained within the Three Degrees. Other programs available on the Academy include the Grand Lodge’s “Iowa Masonic Mentor’s Assistant” (IMA) program as well as the “Optional Mentoring Course” (OMC) which offers both mentors and candidates a value-added experience to the initiation, passing, and raising process.